Staff at a Beijing labor bureau received some unexpected visitors on Tuesday. Alongside the migrant workers who converge daily at the offices in Dongcheng district in the run-up to Spring Festival was a newsroom of journalists all protesting their dismissals and demanding withheld wages. 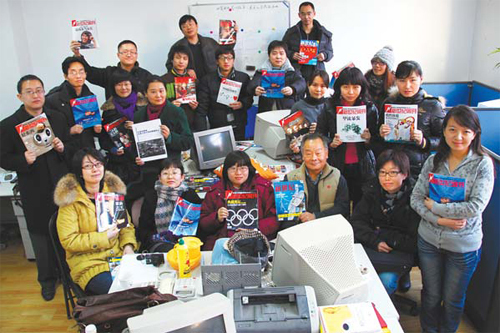 All 21 disgruntled reporters and editors were half way through an editorial brainstorm at News Magazine, a Beijing-based current affairs publication, on Dec 31 when their boss suddenly entered and told them their services would not be required after the New Year holidays. The newsroom was to be taken over by Hu Shuli, former editor-in-chief of Caijing Magazine, and more than 70 journalists who also quit the reputed publication on Nov 9, staff was told. Hu is credited with building Caijing into a massively successful financial news journal but walked out after allegedly arguing with the magazine's investors. She agreed to take over editorial control of News Magazine, known to Chinese readers as Xin Shiji Zhoukan, on Dec 29. But it means that as one group of journalists finds a new home, another is now at the center of a labor dispute. Industry insiders say the move came after Hu's company, Caixin Media, which she set up in early December, failed to get approval to start a new magazine due to China's "difficult" licensing process. "We were all excited Hu would be our new editor-in-chief, but we didn't know we would be tossed out two days later without prior warning," said news editor Tang Yong, 28. "We will do everything to defend our legal rights." Most of the 21 journalists dismissed have not received their basic salaries for two months or payments for stories they wrote in the last six months, he said. Miao Shubin, former editor-in-chief of News Magazine and the man who told staff about the changes on Dec 31, is now the publication's deputy editor-in-chief under Hu. Tang said all 21 journalists were told to stop discussing potential topics for the next issue. What followed was 14 hours of negotiations over defaulted wages, story payments, social security funds and housing allowances. The staff demanded compensation but Miao refused to sign any proposal, said Tang. The magazine is published three times a month - 1st, 11th and 21st - but this month an extra issue produced by Hu's team was released on Monday. It was rebranded as Century Weekly and it did not carry the names of the 21 editorial members sacked. Miao and Caixin Media said reporters could keep working at the magazine if they agreed to serve a three-month probation, according to Tang. All refused and instead posted a joint press release on a sina.com blog on Jan 3 to "claim their justified rights". Tang said the magazine owes them two months' wages and story payments for the last six to eight months. He revealed he alone was owed more than 20,000 yuan ($3,000) in story payments. "My colleagues and I just want what we rightfully deserve," he said. 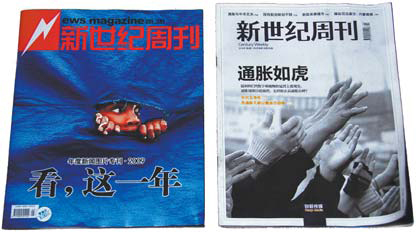 News Magazine was founded in 1988 and earned a reputation for hard-hitting reporting after it covered China's first AIDS case. It has an average readership of about 150,000 nationwide. However, in recent years the business has struggled, and as it already has a license with the China Institute for Reform and Development in Haikou, capital of Hainan province, it was a prime target for anyone looking to take over a magazine, said industry insiders. A company must have a license from the government to print magazines, but as licenses are rare commodities in China they fetch high prices in a fiercely competitive market. The labor dispute resulting from the editorial takeover at News Magazine is becoming a "normal" occurrence these days due to the high demand for permits, said Hu Yong, a professor of communication at Peking University. "Anything can happen in such a market. The licensing system lays the foundation for this behavior," he said. "Magazine licenses are issued and required by the government, and they are very difficult to get. The demand is much higher than the supply and those who have them can sell at high prices." China now has more than 9,500 licensed periodicals, but the authorities seldom issue new permits due to a strict policy employed for the last several years, said a senior magazine editor in Beijing who asked to remain anonymous. offload the struggling venture and its valuable publication permit. "The magazine was negotiating with Caixin Media and other media companies in December. One side was eager to sell its license, the other desperate to get one," said Professor Hu. "In such haste, the rights of the laborers could have been ignored." The deal between Caixin Media and News Magazine, in cooperation with the China Institute for Reform and Development, was finalized on Dec 29. 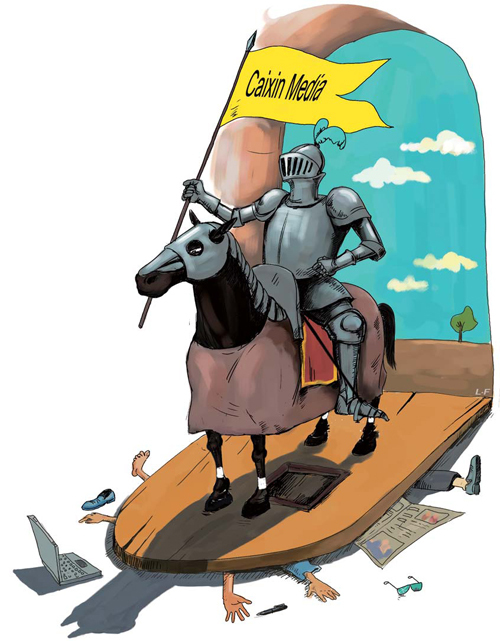 Caixin Media was founded on Dec 10 last year with a registered capital of 100 million yuan, according to the Beijing Administration for Industry and Commerce website, and is involved in production and distribution of advertisements, animation, television programs and documentaries, as well as financial consultancy. Hu Shuli was unavailable for comment yesterday. However, Zhang Lihui, a spokeswoman for Caixin Media, told China Daily the company has had no involvement in the ongoing labor dispute at News Magazine. "We are bothered about the criticism but Caixin Media has not invested any money into News Magazine. Hu and our reporters are simply employed to work for the magazine," she said. "We have nothing to do with the magazine's disputes or its decisions." However, with the arrival of new reporters and editors, the style of the magazine will change from current affairs to financial news, she said. "Caixin Media is willing to employ the magazine's current reporters if both sides can agree on the conditions of employment. Our door is always open. It is still a news magazine but there will be an adjustment in the weight of different kinds of news - financial or social," said Zhang. She admitted the company had discussed putting the current reporting staff on three-month probation. "We talked about the possibility before but didn't reach a decision. I don't know how word got out," said Zhang. An anonymous source within Caixin Media told China Daily: "The issue is fairly simple. We would like to hire all 21 but a few of them did not want that and incited the others to push for higher compensation. If still not satisfied, they can appeal to the courts and we will follow the law." For the 21 reporters and editors axed by News Magazine, Hu Shuli is a hero. Some even credit her with inspiring them to start a career in journalism. Tang Yong said none of them blame Hu for the labor dispute, but he insisted he would not stay to work with the new editorial crew. "We have different styles. We are too grassroots for them," he said. The reporters and editors complained in the highly publicized blog post on Jan 3 that leaders of News Magazine did not consider their existing employees in deciding to bring in Hu and her team. Miao, the former editor-in-chief, did not even bring a seal to sign the compensation agreements when he met with staff and their lawyer, Li Xin, on Jan 4, said Tang. At the time, Miao agreed to pay the delayed money but insisted on signing agreements with employees one by one. The staff refused. Tang explained that employees usually signed one-year contracts that expired at the end of the year. However, all 21 journalists signed agreements with the magazine on Nov 24 last year stating both sides were willing to renew their contracts, he said. Renewed terms were never offered. Li, the lawyer acting for the axed staff, said his clients' priority is to claim the defaulted wages. They are also demanding a 25-percent premium on their delayed payments. However, if they did indeed sign agreements on the intention to renew their contracts, News Magazine will find it hard to get out of them, said Liao Mingtao, a lawyer with M & A Law Firm in Shanghai. "It may be called an agreement instead of a contract, but it should be looked on as a contract if it had necessary clauses and two sides signed it," he said. "Even when there is a change in the majority stockholder of the company, the enforcement of a labor contract should not be affected." If agreements are in place, the 21 journalists should not have to go through three-month probation; if not, their employer had no responsibility to inform them beforehand about the layoffs, said Liao. "Even if they didn't have agreements and their contracts expired, they should be compensated if they wanted new contracts and their employers didn't want to give them," he said. "The compensation is like that. If you have worked somewhere for two years, you receive two times the averaged salary of the last 12 months." As negotiations are ongoing, though, it looks like Tang and his colleagues will be making the news, rather than reporting it, for some time yet. Law tops the table of the 10 most difficult professions to get a job in China. Quality inspectors are again in the eye of the storm for possibly covering up a tainted milk case for almost a year. Jennifer Lopez and Fergie (L) pose during the NFL game between the Pittsburgh Steelers and the Miami Dolphins on the sidelines in Miami, Florida,January 3, 2010. Mariah Carey performs in concert New Years' Eve at Madison Square Garden, December 31, 2009, New York. Asian capitalism, notably China and South Korea are competing with the US for global power. Asian global power is driven by dynamic economic growth, while the US pursues a strategy of military-driven empire building.